In one way, I was surprised that Sam Pinn was at my book-signing in Brooklyn at the Restoration Center in September, but in another way, I shouldn’t have been. It took me several minutes to recognize him since I hadn’t seen him in years. Then came his melodious voice– “I am Sam Pinn.” And then a flood of memories we shared over the years, mainly my reporting on his phenomenal political and cultural leadership. Photographer George Johnson caught our moment of reminiscence and it was posted on Facebook and consequently provided me with all the information needed to begin and complete his obituary. It was from the ever-alert Bernice Green, the publisher of this paper, that I learned of Pinn’s passing. And I was immediately propelled back to the days when I first began discovering what a vital asset he was in our struggle for freedom, justice and self-determination. Daughtry commented further on Pinn’s reflective and keen analytical mind, which were some of the reasons he would chair the Randolph Evans Crises Fund Board of Directors. 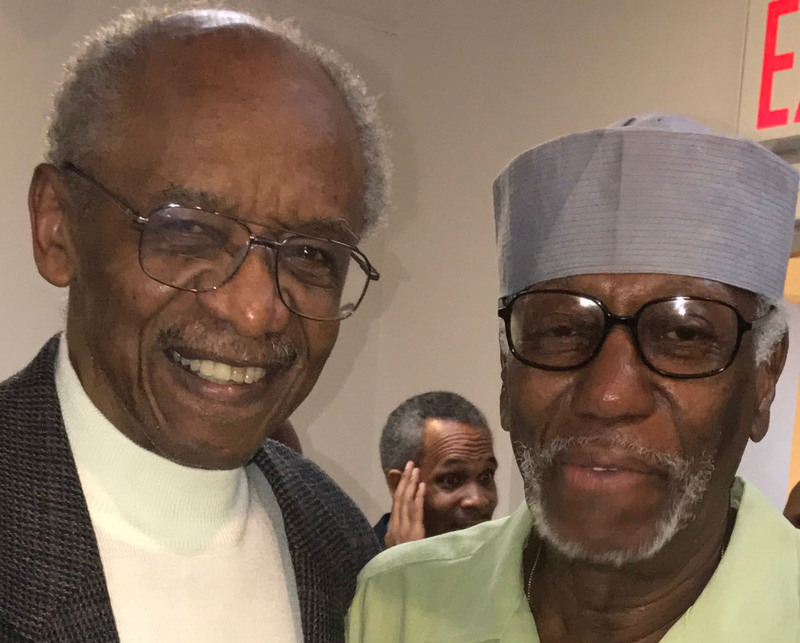 A year later, when the Black United Front (BUF) was formed, Pinn would be among the key members as he would be when the National Black United Front was created in 1980. During this same period, Pinn founded the Fort Greene Senior Citizens Center while teaching his courses at Ramapo College. Similar tributes were posted by Gary Williams, Rachel Brumfield, Eric Frazier and Baba Wesley Gray. Fred Logan, a writer and activist in Pittsburgh, expressed fond memories of Pinn and his generosity in an e-mail. “I remember well staying at his home in 1981 when I went to a NBUF conference with Sanjulo, Naisha and Famamisha from Pittsburgh,” Logan wrote. That same warmth and camaraderie is what I experienced at the book-signing and after he purchased a book and signed it for him, he insisted that I pose with him for a photograph. It was an honor to stand next to someone who I had admired so many years from a distance. During our brief moment together, Sam reminded that it had been some years since I had visited the Senior Citizens Center, and I agreed. But before I could complete another sentence, I was besieged by a group of admirers wanting their books signed. In his customary and dignified way, Sam slipped away allowing me to bathe in the recognition that was part of his remarkable life. I am sure there will be endless praise for him as the day arrives for his homegoing, and I have no doubt that he will join that illustrious band of comrades and ancestors, including a few from Brooklyn, such as Jitu Weusi, Sonny Carson and Robert Taylor, Viola Plummer’s son.